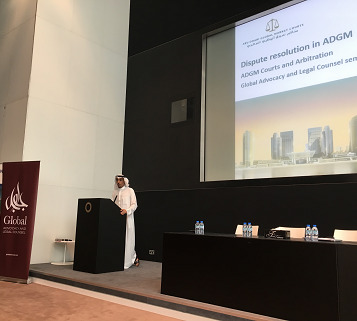 The launch of the new Abu Dhabi Global Market (ADGM) Courts has generated lots of interest as to how they will work, the different methods of dispute resolution available and how they will fit within the current UAE legal structure. In conjunction with Abu Dhabi Global Market, we presented a seminar to address these issues and answer questions about jurisdiction of the new Courts and enforcement. We were joined by Dhaher Mohammed bin Dhaher Almheiri (CEO of the ADGM Registration Authority) who gave the opening address and Linda Fitz-Alan (Registrar and Chief Executive of ADGM Courts) who presented an overview of the Courts. The panel was made up of Global lawyers Ali Al Hashimi, Nasser Al Osaiba, Sharon Lakhan and John McGowan, with guest speaker Michael Patchett-Joyce from Outer Temple Chambers in London.